The Ontario Hockey League announced its rookie of the year and all-rookie teams for the 2017-18 season today, and there are Michigan names throughout. Andrei Svechnikov, a Muskegon Lumberjacks alum and brother of Red Wings prospect Evgeny, was named the league’s rookie of the year. Regarded the No. 2 prospect in the upcoming NHL Draft, Svechnikov posted 72 points in 44 games this season with the Barrie Colts. A pair of Michigan names cracked the the first team all-rookie line-up. 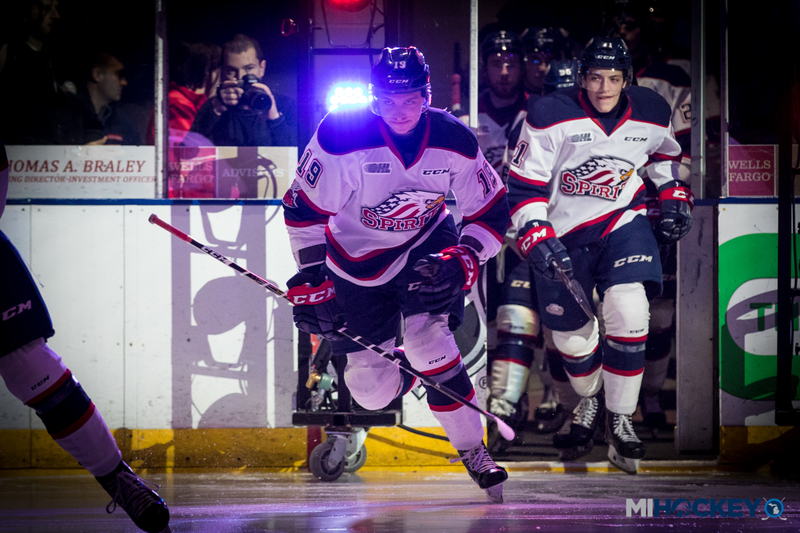 Jackson native Blade Jenkins, a Saginaw Spirit rookie, posted 44 points in 68 games en route to a first-team forward selection. West Bloomfield native Alec Regula, a defenseman with the London Knights, earned top blueliner status with 25 points in 67 games. Mack Guzda, a Honeybaked alum, was the first-team selection between the pipes; the Tennessee native posted a 14-6-2-2 record with a 3.20 goals-against average and one shutout. On the second team, Little Caesars and Compuware alum Arthur Kaliyev was honored. Kaliyev, a New York native, posted 48 points in 68 games.